Patio Rooms are a great way to enjoy the outdoors all year long and expand your living area. Throughout the summer, patio rooms are a great place to entertain, eat meals, or just relax and enjoy some reading. However, when the colder months hit, you might not use your patio room as often. Most patio rooms are designed to be used when the weather is warm, but you can definitely use your patio room during the winter as well! Here are a few simple steps you can take to make your patio room enjoyable all year round. 1. Use a space heater to add heat to the room. Sometimes, the heat from your home is not enough to fill your patio room. Consider using a space heater to keep it warm, and then make sure that warm air doesn't escape through your windows or doors. 2. Insulate your floors and walls. Heat can escape easily through your room if it is not insulated. 3. Insulate the windows by adding a layer of clear plastic. This will improve your energy efficiency and keep warm air inside. 4. Weather-strip the windows. In order to keep warm air from leaking out of your patio room, you have to make sure there is nowhere for it to escape. You can install weather-stripping or clear caulk around your windows to seal any places that would allow the air to escape. 5. Install a ceiling fan to circulate heat. Ceiling fans can work to push warmer air down from the ceiling when you reverse the blades. 6. Use insulated fabric for drapes. Insulated drapes will help keep the warm air in your patio room. You can keep them open during the day to allow the sunlight to warm the room, and close them during the night to keep the warmth inside. Follow some of these steps above to keep your patio room warm and usable this winter! 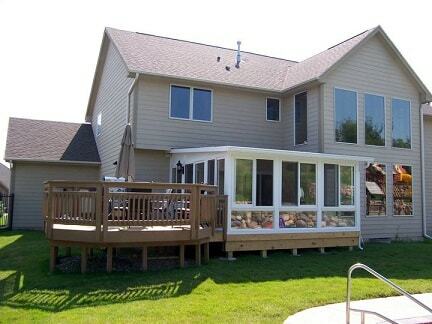 Midwest Builders can help you with all of your patio room needs in Ankeny, Iowa and surrounding areas. Contact us today to get in touch with us and receive a free estimate. We	construct 3 season rooms, 4 season rooms, patio rooms, decks, and garages. We also specialize in basement finishing and other remodels. Let us know how we can help!